For the first time, the card game bridge has been featured as a sport at the Asian Games. The BBC's Vandana Vijay speaks to two elderly women representing India. Until her 50s, Hema Deora was busy taking care of her sons in Delhi, or touring the country with her politician husband Murli Deora, a former petroleum minister. Now at the age of 67, she is representing India in a sport she often played with her friends at home every Saturday. Her teammate Rita Choksi is 79 and one of the oldest competitors at the Games, which began in Jakarta on 18 August and will end on 2 September. Ms Deora and Ms Choksi never thought they would play bridge at the Asian Games, let alone represent their country. Their dreams came true after the organisers of the Asian Games recognised bridge as a sport in 2018. Bridge and chess are the only "mind sports" recognised by the International Olympic Committee but they were not found eligible for the Olympics. However, the card game is the fourth "mind" sport to appear at the Asian Games after board games like chess, go and xiangi, which have been featured at previous events. Bridge is a game played by millions of people across the world in competitions and at social events. The World Bridge Championship, a series of competitive rounds that debuted in 1962, is the most popular sporting meet for bridge players. Ms Deora says her parents didn't allow her to play cards while she was growing up because it was seen as an activity for adults. But things changed after she got married. Her husband, who liked the game, would often call his friends home to play. She said it soon became a weekly routine and guests would come to play even during heavy rains or thunderstorms. "I used to wonder what was it about this game that made people forget everything around them," Ms Deora said. At first, she didn't take much interest in the game. But once her children left home for university, she had more free time and decided to learn bridge. "I thought to myself, why not learn a game that I had watched people play all my life?" It was "hard work at first" but once she learned the basics, she found a coach to become an expert player. How do you play bridge? In bridge, or contract bridge, all the cards are dealt from a standard 52-card deck. Two players from each of two teams sit opposite each other across a table and through a bidding process (auction) agree to win a number of tricks. Suits are ranked upwards - clubs, diamonds, hearts, spades and no trumps. If they achieve the number of tricks agreed at auction they win the game but if not, they lose. The team with the highest number of games wins. These are the basic rules. At higher levels, the game includes bonus points, complex dealing and other rules. Soon she started playing in local clubs and tournaments, winning trophies along the way. One of her fondest memories is playing against Bill Gates and Warren Buffet at an event. For Ms Choksi, the game holds a special place in her heart. "Bridge gave me my second husband," she said. After her first husband died, she met Haren Choksi during a game of bridge and they decided to become playing partners. They soon became friends and eventually fell in love. However, Dr Choksi died in 1990. She was once again alone, but bridge helped her overcome the loss. "It was a tough period in my life. I was alone, but I wasn't lonely because I had my cards," she said. Ms Choksi and Ms Deora are not the only elderly bridge players in the Indian team. Many of them are over 60 years old, which makes for a rather unusual sight at any major sporting event. But Ms Choksi said age was not a factor in the game. "Bridge is beautiful because it is about the mind - it keeps you agile and refreshed," she said. Commonwealth Games: A turning point for Indian sport? Their presence at the Games is expected to boost bridge's popularity in India. "It would be great if this exposure can remove the gambling stigma attached to bridge, and also help in finding sponsors," says Anand Samant, one of India's most successful bridge players. In many Indian households, playing cards is still considered a man's game because it's often associated with gambling. 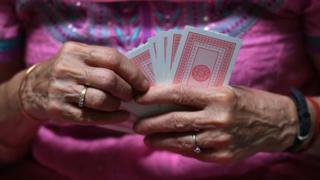 But for women like Ms Choksi and Ms Deora, playing cards is far from a taboo. "It is a sport that has given me a lot of personal gratification," says Ms Deora, whose husband died in 2014. "Let me tell you something - if you invest in bridge, you will never be lonely in your old age."